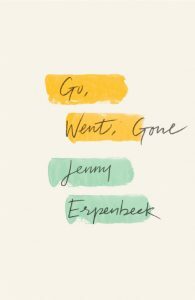 I stumbled onto Go, Went, Gone, a novel by Jenny Erpenbeck (and translated from German by Susan Bernofsky), thanks to a review in the New Yorker, and I’m so glad I did. The unassuming but important story dropped me into a world I’d heard about only on the news and made it personal, something fiction can do so well in the right hands. The narrator, Richard, is a recently retired academic. He lives in Berlin, east of a wall that is no longer there. His wife has died, and retirement brings nothing but loneliness; “As of today, he has time—plain and simple.” A few pages later, we learn that “Richard really will have to be careful not to lose his marbles.” Trivial details paint a picture of a mind desperate for a new focus—a lawnmower blade sharpened, an unwavering breakfast and dinner routine—until his curiosity leads him to interview African asylum-seekers who are camped out on the Alexanderplatz, a square in the middle of Berlin. Like Richard, the refugees want to work but can’t. They are stuck in a limbo caused by European Union law, which states that refugees can only work in the country where they first register. For these men, that’s Italy, where there are no jobs. Germany needs workers, but they are not allowed to register there. As the story unfolds, Richard discovers more and more commonalities between himself and these men, despite all the superficial differences (country of origin, skin color, financial status). He also discovers how far apart their worlds are when he tries to explain to one of the men about the Berlin wall. Probably this isn’t the right way to ask this question when speaking to a person from Niger. “Did you know that there used to be a wall in Berlin that separated one half of the city from the other?” he asks. “Yes, he killed people—but only a few,” Richard says quickly, because he’s already feeling bad about getting carried away almost to the point of telling this boy, who’s just fled the slaughter in Libya, about slaughter that happened here. No, Richard, will never tell him that less than a lifetime ago, Germany systematically murdered so many human beings. All at once he feels deeply ashamed, as if this thing that everyone here in Europe knows is his own personal secret would be unreasonable to burden someone else with. And an instant later, just as forcefully, Richard is seized by the hope that this young man’s innocence might transport him once more to the Germany of before, to the land already lost forever by the time he was born. I’ve added quote marks for clarity here, but the lack of them in the novel removes barriers between speech and thought. It’s easy to follow Richard’s rambling mind as it jumps from past to present and back again. My only criticism is Richard’s obsession with a former lover, which doesn’t seem important to the story, but perhaps it is a way of showing Richard as flawed right from the beginning. All the characters are imperfect, but somehow hope shines through the quiet desperation and inhuman treatment of the immigrants’ lives. It is a peek into a Germany I had never seen before. I’d also never heard of Jenny Erpenbeck, so now I’m going to seek out her previous books—if only for the inspiration to make every word and sentence and scene of my own books carry as much weight as her translated ones. As reviewer James Wood wrote in A Novelist’s Powerful Response to the Refugee Crisis, Erpenbeck’s “task is comprehension rather than replication, and she uses a measured, lyrically austere prose, whose even tread barely betrays the considerable passion that drives it onward. 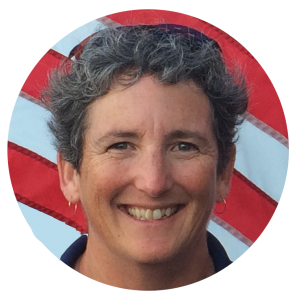 (Susan Bernofsky deserves immense credit for bringing this prose to us in English. )” Agreed.